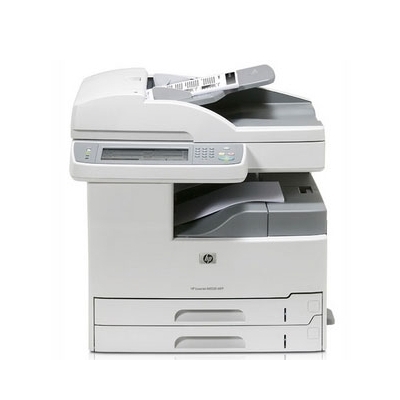 The HP LaserJet M5035 offers office copying, scanning, and printing needs all in a single desktop package. It can handle tabloid-size paper with1200 x 1200 dpi resolution and speeds up to 35 pages per minute. The 2007 M5035 also can store jobs in its internal hard drive and send e-mail, either via its large LED control panel or through software installed on your computer. Starting at 45 pounds with a 23” x 24” footprint, the LaserJet M5035 multifunction is a little large to put on a desk. But it will feel right at home on any table or credenza where it’s 31“ height brings it at a height comfortable for someone standing next to it to manually make copies or scans. The control panel gives a person full control of copy and scanning features without the need to install special HP software on their computer. The panel consists of a large VGA touch-screen with multiple menus, a 10-key pad for copies, and the traditional buttons and indicator LEDs for printing. Using HP’s instant-on fuser technology, print can start as fast as 8 seconds, with print speeds up to 35ppm. Printing in monochrome using 1200 x 1200 dpi resolution, the multifunction keeps text sharp--even at 6-point font sizes--and does a decent job with printing graphics in B&W. An Ethernet port and 250MB of expandable memory allows the M5035 to easily handle any print job from networked computers. This multi-function has two-ream paper trays: one for up to 250 legal-size sheets, and the second, oversize tray for 250 sheets of 11" x 17” paper. The two-tray feature is especially nice in an office where legal and standard size papers are often used. Non-standard sizes from 3” x 5” up to 11” x 17” can be placed singly on the scanning platform, or up to 100 sheets placed on the multi-purpose flip-tray on the side of the copier. Adding the optional paper trays can expand the M5035 to supporting up to and additional 1,000 sheets. The M5035 uses an 11” x 17” platen to support scanning up to ledger or tabloid-size single documents and books. The automatic reversing document feeder allows for scanning up to 50 double-sided originals. The LaserJet multifunction has three different copy exposure modes & resolutions up to 600 x 600 dpi to handle text to photo reproduction. The magnification can be automatically or manually changed from 25% to 400%, and up to 999 copies can be made at 35 pages per minute. 2-sided (duplex) printing requires the additional purchase of the optional Duplexer unit. In addition to sending via e-Mail address, the M5035 can also share scanned images into a networked shared folder. Installing the HP software on your computer’s Desktop. 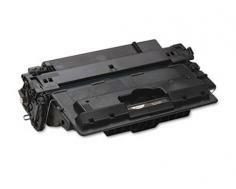 The 40GB built-in hard drive allows the M5035 to actually save and retrieve print jobs. These jobs can be saved in individual folder directories on the printer. You have the option of setting a 2-digit PIN (Personal Identification Number) on print jobs for a modest level of security. In spite of the fact that most business correspondence is by e-mail, for various reasons certain institutions (mostly the financial ones) still require certain forms and contacts to be faxed instead of just accepting an e-mail with the scanned document attached. If HP added a facsimile mode, this would be the perfect all-in-one for any business. Practically silent in idle, the M5035 does a bit of roaring when it’s printing. At 66dB, the multi-purpose is louder than a room full of people talking. But since the M5035 will likely be stationed in a print room and not be plopped down inside someone’s office, the noise should not cause a disturbance with workers. 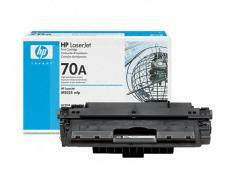 Review it: "HP LaserJet M5035 "
The LaserJet M5035 toner and drum are integrated in a single cartridge, making it easy to maintain. The toner cartridge yields up to 15,000 pages. This is great for a department or an office with heavy printing demands.